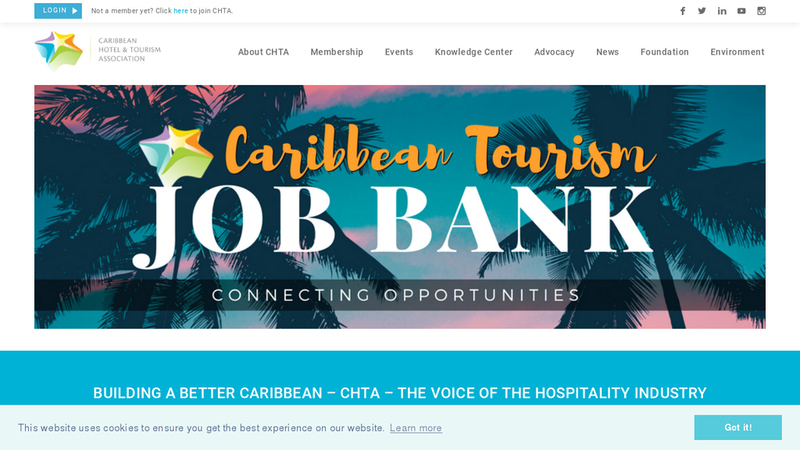 MIAMI (April 2, 2019) - The Caribbean Hotel and Tourism Association (CHTA) is inviting nominations for the Caribbean Hospitality Industry Exchange Forum (CHIEF) Awards from the region's tourism and hospitality sector as it recognizes outstanding initiatives that are making a difference in the industry. The CHIEF Awards were established five years ago to recognize, celebrate and share best practices, which are then presented at CHTA's annual CHIEF forum. This year's event is scheduled to take place at Hyatt Regency Miami from June 21 to 23, 2019. "Caribbean hoteliers and tourism-related businesses continue to elevate their game, recognizing that offering incredible sun, sand and sea is not sufficient to compete in the growing global tourism marketplace," stated CHTA president Patricia Affonso-Dass. Affonso-Dass noted " the nominations are also avenues for resort owners and operators to honor their outstanding staff members who made these practices the best. " The CHTA president said the CHIEF Awards should contribute to the resilience and healthy growth of the tourism and hospitality sectors: " This year, we will be looking very closely at best practices which can be shared throughout the region. We want the finalists and winners to have bragging rights and we want others to aspire to replicate and adapt these winning initiatives into their own operations. " The top three finalists this year in each category will be invited to present their best practices at CHIEF in June. The finalists and overall winner will be recognized at the forum's awards session. CHIEF will be held under the theme "Vision 2024: Embracing Change, Diversity and Growth". "As CHIEF enters its fifth year, our theme dovetails well with the awards' objective of recognizing and sharing the outstanding work of many in our industry," added Affonso-Dass. Registration for this year's CHIEF event has opened, with details available at www.CHTAChief.com or by contacting events@caribbeanhotelandtourism.com. Produced by the Caribbean Hotel and Tourism Association (CHTA), the Caribbean Hospitality Industry Exchange Forum (CHIEF) is the premier educational forum for Caribbean hospitality and tourism professionals. CHIEF is where hospitality industry professionals assemble to connect, learn best practices, share ideas, brainstorm creative solutions to current challenges and build relationships. Held under the theme, "Vision 2024: Embracing Change, Diversity and Growth", the forum attracts hoteliers, vendors, government officials and industry experts focused on a stronger, profitable and more sustainable industry.